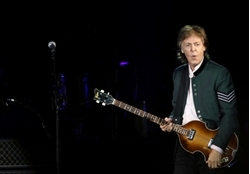 Paul McCartney among 9 Wolf Prize recipients . Beatles Radio: The Beatles, Solos, Covers, Birthdays, News The Fab 4 and More! British musician Paul McCartney performs during the "One on One" tour concert in Porto Alegre, Brazil. The Israeli Wolf Prize will be awarded at the end of May to nine laureates in the fields of music and science, including legendary British rocker Sir Paul McCartney. The nine laureates – in the fields of music, agriculture, physics, chemistry and mathematics – are invited to a special ceremony at the Knesset hosted by President Reuven Rivlin at the end of May.